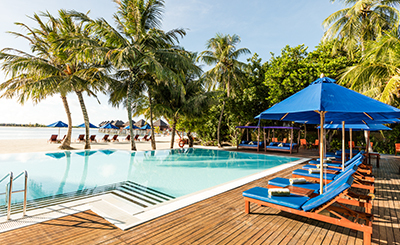 Olhuveli Beach & Spa Resort is located in South Male Atoll, nestled amidst tropical vegetation and shaded by graceful palms. 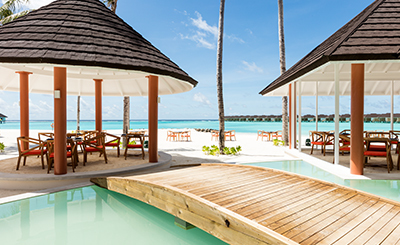 The resort is surrounded by a vast sandy beach and a crystal clear lagoon, this is a truly beautiful island. 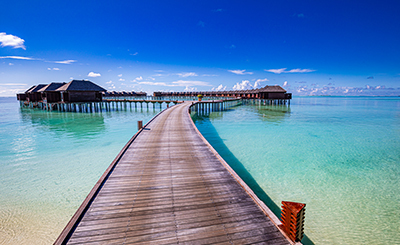 The resort is 25 kilometers from the Male International Airport and it takes 45 minutes by speedboat to reach here. Lagoon Restaurant:This is our a la carte restaurant. It offers a peaceful and tranquil setting for either a light snack or a 3 course romantic dinner. Sunset Restaurant:Sunset Restaurant offers a multinational gastronomic pleasure to all our clients by bringing in Italian, Chinese, South East Asian. Sakura Restaurant: The Japanese Restaurant â€œSakuraâ€ is located South part of the resort (right side of Jacuzzi Water Villas) open for lunch & dinner. Dhoni Bar: Dhoni Bar offers exotic alcoholic fruit cocktails and non-alcoholic drinks such as smoothies along with B.B.Q Grille offering snack and ice cream all through out the day with swimming pool. Lagoon Bar: Situated just off the main jetty, opposite the Sunset Restaurant, the Lagoon Bar is our main bar on the island housing our weekly schedule of entertainment. Sunrise Bar: Located in amongst palm trees and pool area, the Sunrise Bar is the perfect location in which to catch the sunrise and to spend a lazy day sunbathing around the pool. 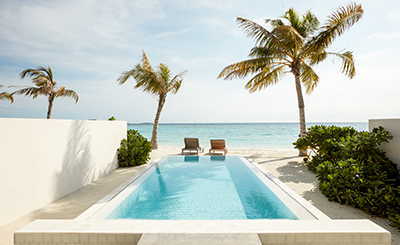 8 Beach Villas are individually appointed facing prime beach front. 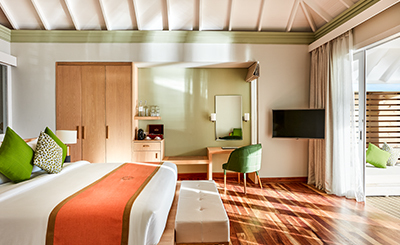 The en-suite bathroom is large with an open-air enclosed courtyard for maximum privacy, featuring a large sala for an afternoon siesta. 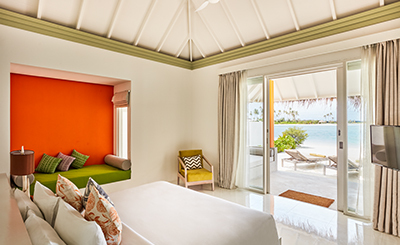 63 Deluxe rooms are Beach fronted and have a terrace or balcony overlooking the beach and the lagoon. 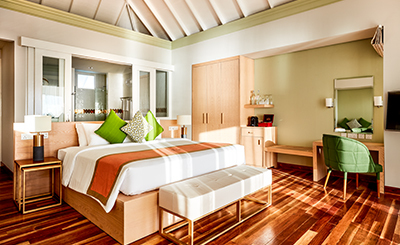 32 Jacuzzi Water Villa Provide the same facilities as in the Deluxe Water Villas. 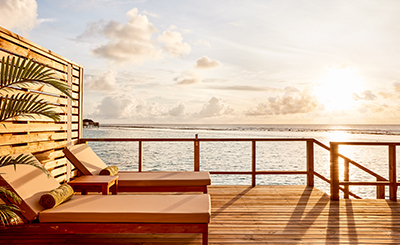 A Jacuzzi takes pride of place in the large private sundeck, which extends out over the lagoon. 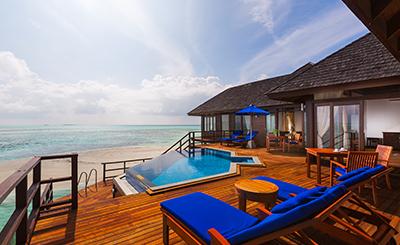 5 Honeymoon Water Villas Discover island life at its fullest in these luxurious Villas each of which offers the same amenities as that in the Jacuzzi Water Villa.